Doral, FL., June 29, 2017 / — US MED, one of the nation’s leading suppliers of Diabetes related products, is pleased to announce that they will be joining with leaders in the blindness industry to form the Blind Diabetes Group. The mission of the Blind Diabetes Group is to provide the highest quality diabetes products, audible training, and peer support in effort to ensure members live healthy and independent lives. VisionAwareTM and the National Federation of the Blind Diabetes Action Network are two of the groups providing access to audible living with diabetes & blindness training materials. Blind Diabetes Group members are asked to listen to about 15 minutes of living with diabetes and blindness training materials each week. Senior Center Without Walls has made available a Blind Diabetes Peer Support Group. Blind diabetics from across the country join in a weekly 45 minute conference call to discuss what they learned from that week’s training materials and how to put it to use! Group members are welcome to talk or just listen in. 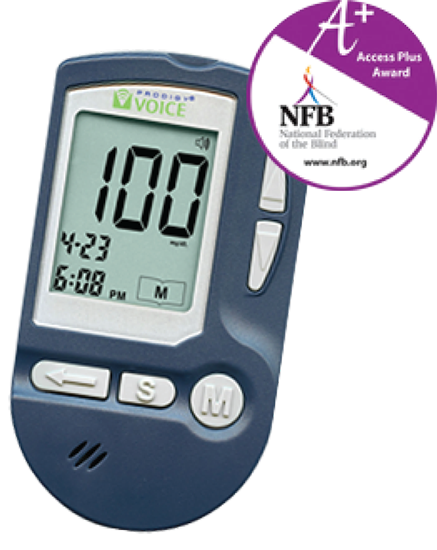 Voice glucose meter to members with Medicare and select Private Health Plan coverage. Medicare and health plans determine the reimbursement pricing and co-payments required. US MED can also offer the meter as a cash option. For additional information, visit the Blind Diabetes Group page to sign up and get started making friends and learning how to live well with diabetes and blindness. US MED has contracted with Jerry Munden, former Prodigy Diabetes Care Vice President and recipient of the 2011 National Federation of the Blind Bolotin Award, to be their primary connection to the vision impaired population. Jerry has lived well with diabetes for 45 years himself and he has a passion to help others to do likewise.